Choose your dessert straight up in a bourbon glass. Ditch that famous pie this Kentucky Derby and offer your guests a layered dessert in a bourbon rocks glass. 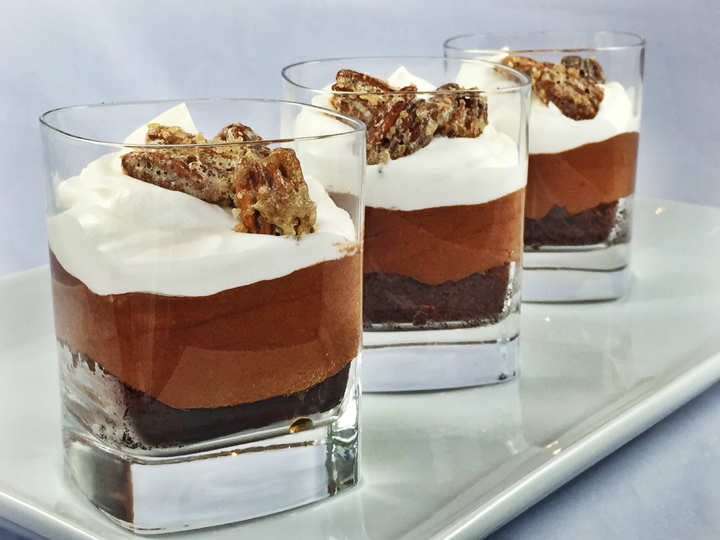 We fitted bourbon infused brownies in the bottom of bourbon rocks glasses then added bourbon chocolate mousse, crème fraîche whipped cream and topped them with candied pecans. It’s a whole new twist on a“neat” bourbon. Preheat oven to 350 degrees F. With softened butter, grease an 8 x 8” baking pan. Line the bottom and up two sides with one piece of parchment; grease the parchment. Flour the pan and parchment liner with unsweetened ground cocoa; set aside. In a medium saucepan combine sugar, butter, and 2 tablespoons of water. Cook and stir over medium heat just until boiling. Remove from heat. Stir in the chopped chocolate pieces until melted. In a large bowl combine the eggs and vanilla. Slowly temper in the warm chocolate mixture into the eggs beating with a whisk until just combined. Stir in flour, baking soda, and salt mixture. Pour the batter into the prepared baking pan, spreading evenly. Bake for 20 to 25 minutes or until a wooden toothpick inserted near the center comes out clean and edges start to pull away from sides of pan. Place pan on a wire rack and brush the top of the hot brownies with the bourbon. The brownies can be made a day ahead of time. Wrap airtight after completely cooled and store at room temperature. Preheat oven to 325° F. Line a quarter baking sheet with parchment paper. Whisk the egg whites until frothy. Add the sugar, salt, and whisk to incorporate. Toss in the pecans and mix until coated. Pour the nuts on the prepared baking sheet. Separate and place the nuts flat side down and sprinkle the tops with the turbinado sugar. Bake for 15 minutes or until browned. Let cool completely. Can be made a day ahead of time. Store in an airtight container at room temperature. Bring the heavy cream and sugar to a boil in a small saucepan and immediately remove the pan from the heat. Stir in the bourbon, vanilla and salt. Add the chocolate and let it sit for 5 minutes without stirring. Whisk the chocolate and cream until smooth and transfer to a large bowl. In another bowl, beat the egg whites with a mixer on high speed until they form stiff peaks. With a rubber spatula, fold about one-third of the beaten whites into the chocolate to lighten it. Then gently fold in the remaining whites, in two batches, just until the white streaks disappear, being careful not to deflate the whites. Place in the refrigerator for at least 30 minutes. Chill the mixing bowl and whisk for 30 minutes in the freezer. Add the sugar and cream to the chilled bowl and fit an electric mixer fitted with the chilled whisk. Beat to medium peaks. Add the vanilla and crème fraîche then beat until incorporated and mixture is forming stiff peaks. Using a small knife or cookie cutter, cut a piece of brownie to fit inside the bottom of each of the six bourbon rocks glasses. Top with ⅙ of the chocolate mousse, then ⅙ of the vanilla whipped cream. Refrigerate, covered, until ready to serve. Right before serving, top each with the candied pecans.